The Baltimore WorkCamp is a Catholic week-long service experience serving residents in and around the Archdiocese of Baltimore. Our mission is to serve our brothers and sisters in need by making their homes safer, warmer and drier while living in a faith-filled Catholic community. 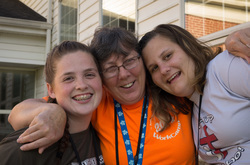 Trusting that the Holy Spirit will inspire all WorkCampers to love God and our neighbors as ourselves, the BWC is guaranteed to inspire those who participate. WorkCamp is not your ordinary youth event. It is a unique opportunity for parishes across the Archdiocese of Baltimore to make a difference in the lives of those in need in our own Archdiocese. WorkCamp encourages teens (rising 9th graders through graduated 12th graders) and all participating adults to answer their baptismal call to serve others and to grow in their Catholic faith.